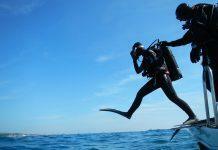 Home Blog Medical Scuba Diver Medical Q&A: Can you go hang-gliding after a dive? Q: I’ve been diving for 30-odd years and was a smoker until five years ago (I’m now 48). Unfortunately I think I left giving up a bit too late – I was diagnosed with chronic obstructive pulmonary disease (COPD) six months ago. The docs say it’s mild but because I smoked for 20 years (an average of 40 a day), it’s likely to get worse. I do wake up coughing and have to clear some fairly putrid-looking oysters in the morning, but otherwise I’m pretty fit (still run and cycle to work). Can I still dive? A: Your typical COPD case is picked up in those aged 45 or older, with a smoking history of at least 20 pack-years. (One pack year is equivalent to smoking 20 cigarettes a day for one year, so in your case you have a 40 pack-year history.) Early symptoms such as frequent throat clearing, breathless on mild exertion and an irritating cough are often blamed on ageing or lack of fitness. Progression to chest tightness and wheezing may take years, but other behavioural signs may appear first – avoiding the stairs in favour of the lift, taking longer to mow the lawn, etc. Lung infections become more common and severe as time wears on. Your major achievement has been to stop smoking, which is the most important treatment. There’s nothing you can to do to reverse the damage, but at least it won’t accelerate now. Medications can help widen the airways and treat infection. I’m afraid your diving days are numbered though; poor lung function will reduce exercise tolerance and put you at risk of barotrauma. Borderline cases with very mild symptoms and satisfactory lung function tests might get away with it, but it’s difficult to be certain of safety and personally I wouldn’t risk it. Time to hang up those fins. Q: As well as being a keen diver I also have a passion for hang-gliding. I suspect I already know the answer to my question, but I’m going to ask it anyway – would it be safe for me to go hang-gliding after a dive? I’m guessing ‘no’, but I wondered whether there are any tables or formulas to give me some idea on how much altitude I can gain before the risk of DCS becomes too high. Surely our venerable Royal Navy or Air Force would have looked into this, but maybe the information is top secret stuff. Can you help? A: I can’t imagine why you’d want to jump off a cliff and catch thermals immediately after a dive, but each to their own. You are correct – from the point of view of DCS risk, this would be an eminently unsafe thing to do. That said, there are occasions when people have no choice but to ascend to altitude, for example in military situations. Far from being top secret, the US Navy guidelines are publicly available. There are tables therein which enable you to calculate the surface interval required before flying, dependent on the planned increase in altitude and the highest repetitive group designator obtained in the previous 24 hours. If you absolutely must fly, the current generic recommendations are to do it ‘as low as safely possible, preferably less than 1,000 feet’. Although I’ve never tried hang-gliding, I would imagine that it’s easily possible to exceed this altitude, and moreover find it very difficult to control the speed of ascent if you end up in a thermal. Might I suggest a slightly less provocative post-dive pastime – macramé perhaps, or beekeeping?